A simple but profound comment from Dr Mark Glazebrook’s teenage daughter sparked a business idea that could literally change the world. When Taya asked her father why inventors were always men, a “horrified” Mark sprang into action. He had already displayed an entrepreneurial spirit as BP’s Head of Social Responsibility, where he helped develop a fuel that could not be sniffed by vulnerable youths. This time, Mark wanted to encourage girls to reach their creative potential and unlock skills that many did not realise they had. “I set about creating a schools based program to introduce girls to practical innovation and business development to help inspire them to become entrepreneurs and business owners taking their ideas to the marketplace,” he says. Girls Invent is a comprehensive series of workshops that enable girls to generate their own product ideas and refine them over the workshops so they are ready for the market. The program is integrated into the school curriculum, bringing STEM (science, technology, engineering and maths) to life and helping motivate girls to choose technology studies. It provides online training for schools and parents to encourage and enable girls to consider entrepreneurial careers. “We also provide strategic advice to schools and their leadership teams on building innovation into the school culture and curriculum,” Mark says. In its first 12 months, Girls Invent grew from zero to more than 60 schools in four states, inspiring 2000 girl inventors to create 2600 inventions. The business works with schools, universities, students and parents locally, interstate and overseas. Unlike more generic children’s programs, Girls Invent focuses on supporting girls and young women. 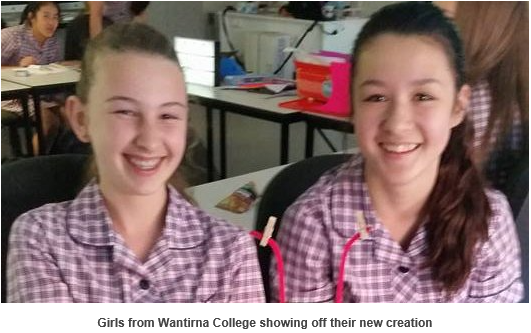 “We do this to create a supportive space where girls gradually build their self-belief in their ideas without unnecessary distractions,” Mark says. Mark knew his business had enormous potential, but wanted to ensure he had all his bases covered. He found SBMS through Startup Victoria and was matched with mentor Joss Milner. Joss is an experienced business mentor and chartered accountant with more than 25 years’ experience primarily in IT and start-ups, including commercialisation and overseas expansion. Mark wanted Joss to help him to review his work to date and assess different options to better respond to the growing interest and demand for Girls Invent. During their initial session, Joss helped Mark to clarify his ideas and thoughts. “Mark is highly intelligent and clearly an innovator,” Joss says. “The mentoring was able to assist him in confirming the best way to scale his business going forward,” Joss says. Since seeing Joss, Girls Invent profits have increased by 30 per cent, new customers and enquiries are up by 20 per cent, and sales and exports by 10 per cent. Mark is also developing more innovative ways to attract new people to help the business grow and has purchased new software and graphic design expertise. “Mentoring helped confirm those management skills that were working well but also highlighted opportunities to refine my responses where these were leading to unnecessary duplication and confusion,” he says. “Our new marketing approaches are connecting with more schools and thus creating more employment opportunities”. Mark is extremely pleased with the help that Joss provided. “The sessions helped highlight better ways to scale my business without scaling up my stress, working smarter, not harder,” he says.